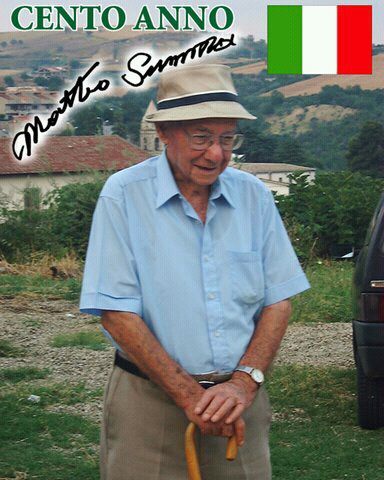 Our Grandfather Matteo was a bricklayer by trade. He built many buildings out of brick. Brick by brick laying a strong foundation to last through the years. Biaggio Summa in a little village named Ripacandida, Italy. or to be buried. So, his parents were sure they would lose their little son. But he lived and it must have been a joyous time. his father taught him. He went out everyday looking for work in New York. 1926 – After 6 years in America he returned to Italy. there wasn’t any work in Italy. 1936 – It would be 6 years before he could send for his wife and child. There was hardly any work here due to the GREAT depression. bought their first home and raised their family. always the first to be hired on a building project and the last to be laid off. During these days he gave more than a few people a helping hand up. was when this American dream came true. visit with his Father after 28 years. 1965 – 1986 – His last child was married. and 3 great great grandchildren. 1987 – He lost his beautiful daughter, Madeline. 1988 – Moved down south to Cape Coral, Florida. 1995 – He lost his beautiful wife Antoinetta, after 63 years of marriage. 1997 – Went to Italy to visit his sister who he did not see in 52 years. 2003 – At the age of 99, he bought a brand new car. 2013 – May 5th Happy 109th Birthday. happiness, some tears and many memories. He saw many friends and loved ones die. Los Angeles, Las Vegas, South Carolina, New York, Chicago and Florida.